The Ebac CD425 Dehumidifier is an extremely powerful unit designed to meet the needs of industrial and commercial users with very large areas requiring dehumidification, including those with very severe conditions. The unit can be employed by itself or, if larger areas require moisture control, multiple units can be used across a workplace on any scale. The Ebac CD425 is tough and durable, with a low maintenance requirement. The Ebac CD425 Dehumidifier has a water extraction capability of 285 pints per day at a temperature of 80°F and relative humidity of 60%. These conditions have become a standard for comparing the capacity of dehumidifiers due to their adoption by the Association of Home Appliance Manufacturers (AHAM). They are, perhaps, more applicable to room dehumidifiers as in many industrial and commercial applications conditions can be much more severe. In such conditions the Ebac CD425 is capable of removing as much as 400 pints. This capacity makes the Ebac CD425 dehumidifier a very powerful machine and is rated by the manufacturer as effective in very large areas, up to a maximum of 10000 sq ft. 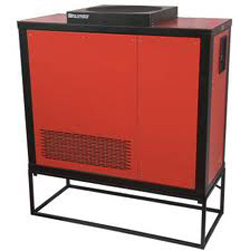 In the case of larger establishments more than one dehumidifier may be utilized to control the environment. The Ebac CD425 offers two installation options. It may be operated as a stand-alone unit where this is most appropriate or can be utilized for ducted applications as required. This feature enables the CD425 to operate as effectively in a number of smaller enclosed spaces as in a single larger area. The Ebac CD425 dehumidifier is engineered for the harsh conditions it may be subject to in some applications. It is a durable unit with a welded steel chassis and casing to which baked epoxy and vinyl coatings are applied to provide additional protection against impacts and abrasions. Extreme atmospheric conditions present no problems for the Ebac CD425. It is capable of low temperature operation due to the incorporation in the design of Ebac's hot gas defrost system which actively melts ice as it forms on the coils. This system enables the CD425 to operate effectively in ambient temperatures as low as 33°F. High temperatures present no greater challenge as the top of its operating range is 95°F. For precise humidity control the Ebac CD425 dehumidifier is equipped with an adjustable humidistat with which the ideal level of relative humidity may be pre-programmed. Once programmed the unit cycles on and off as required, maintaining a constant level of relative humidity while ensuring the most energy efficient use of the dehumidifier. The Ebac CD425 has a lamp array with which the operating status of the unit can be seen at a glance and the noise level produced by the unit is a commendably quiet 69dB. The Ebac CD425 is available in three models, Nos. 1018110, 1018125, and 1018150. All three models have the capability for continuous drainage. The "10" and "50" models achieve this by means of a gravity feed which will require the availability of an adjacent drain at floor level to discharge the condensate. The "25" model is equipped with an integral condensate pump which will force the water a greater distance horizontally or raise it to a convenient outlet at a level above the site of the dehumidifier. In all other respects the three models are identical.